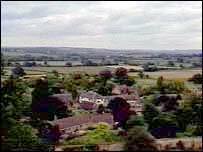 People living in a Somerset village made famous by the poet TS Eliot are going to the polls in an attempt to beat urban sprawl. 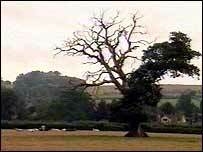 The residents of East Coker want to stop the nearby town of Yeovil spreading into the open fields around their homes. They fear that if government-recommended plans for 600 homes and a business park go ahead, the open space surrounding the village will be swallowed up. And they are using a little-known piece of ancient legislation to hold a parish-wide referendum on the issue. Stan Turner, chairman of East Coker Parish Council, said: "The development will encroach on our village and bring us closer to Yeovil. "We don't want that - we want our heritage, our village, kept separate." East Coker was much loved by poet TS Eliot, whose ashes are buried in the village, and featured in his work The Four Quartets. And the referendum is supported by the most famous current resident Trevor Peacock, who starred as bumbling parish councillor Jim in the Vicar of Dibley. This is one of the most beautiful spots in Somerset - the idea of digging it up and building on it is wrong. He has added his comedy catchphrase to the campaign, putting up posters around the village proclaiming: "Trevor Peacock says no - no - no - no - no -YES to the referendum." He said: "This is one of the most beautiful spots in Somerset, probably in the United Kingdom. "The idea of digging it all up and building on it, well, everybody realises it's the wrong idea." Robin Page, of the Country Restoration Trust told the BBC: "There is absolutely no reason why we should be expanding in the south because there are towns in the north which are bleeding jobs, bleeding factories - they need to be regenerated. "The population growth if Britain is 0.1% but growth in the south of England is totally out of control, it is a phoney growth - the growth should be going up north." He added: "The other important thing about this issue is that we are losing democracy at a local level - we are no longer allowed to decide our own future."